The Pan Am Games are the 3rd largest international multi-sport Games behind only the Olympic Summer Games and the Asian Games, and the TORONTO 2015 was their largest ever, including over 7,000 athletes from across Latin America, South America, the Caribbean and North America competing in 48 sports. Held every four years, the Pan Am Games are immediately followed by the Parapan Am Games which included over 1,600 athletes from 28 countries competing in 15 sports, all of which were Paralympic qualifiers for the Rio 2016 Paralympic Games. For an event of this caliber the Pan Am Games organizers chose to work with Eventbase because of our experience creating apps for world-class sporting events including the Vancouver 2010, London 2012, and Sochi 2014 Olympics. The Official Pan Am Games App was downloaded almost 200,000 times and provided attendees the ultimate one-stop-shop to the Games including Discover, a rich media interactive event showcase; handy spectator info; the full schedule, results and medal count which were updated in real time; and the full PANAMANIA schedule, the arts and culture festival which enriched both the Pan Am and Parapan Am Games. 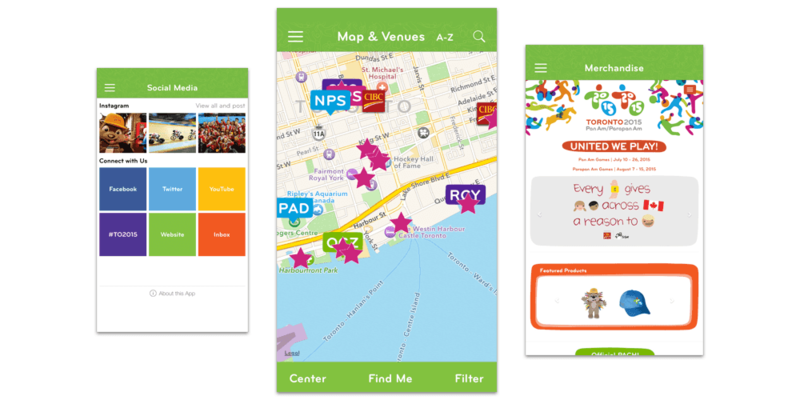 The app, which seamlessly switched from Pan Am to Parapan Am branding between Games, also included many advanced features which differentiated the user experience and focused on maximizing engagement. Sports fans could follow the Pan Am and Parapan Am Games Torch Relays in real time; a built-in Fan Networking Game complete with actions such as tweeting or checking in to earn points added a fun gaming element within the app; and for the closing ceremonies Eventbase worked with Wham City Lights for the first time to amplify the live experience of the ceremonies by creating a customized, crowdsourced light show. In addition, lead sponsor CIBC maximized their sponsorship value by using beacons to highlight their bank machines set up at different venues and sites.